Park 540 DPX 4WD diesel powered front cut mower with 110cm deck and hydrostatic transmission powered by a Hatz 1B50V engine. The Park 540 DPX 4WD benefits from hydraulic power steering making it effortless to steer around your garden. 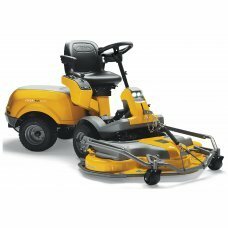 With a large 110cm deck with infinite electric height of cut adjustment that can be made without leaving the seat. Axle Diameter- Front 1" Rear 3/4"